Who loves the idea of eating jam tarts for breakfast? I certainly do. 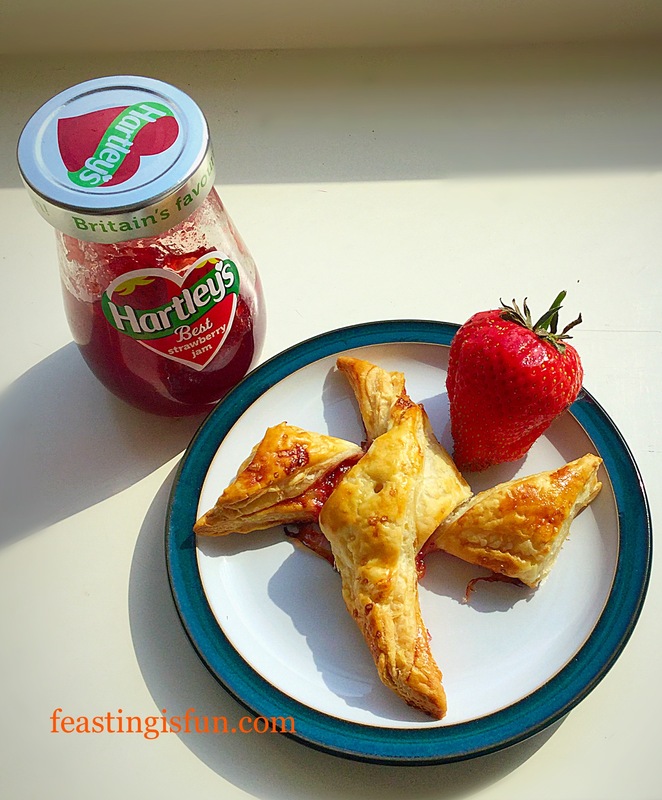 My Twisted Fruity Jam Tarts are a fun way to start the day. 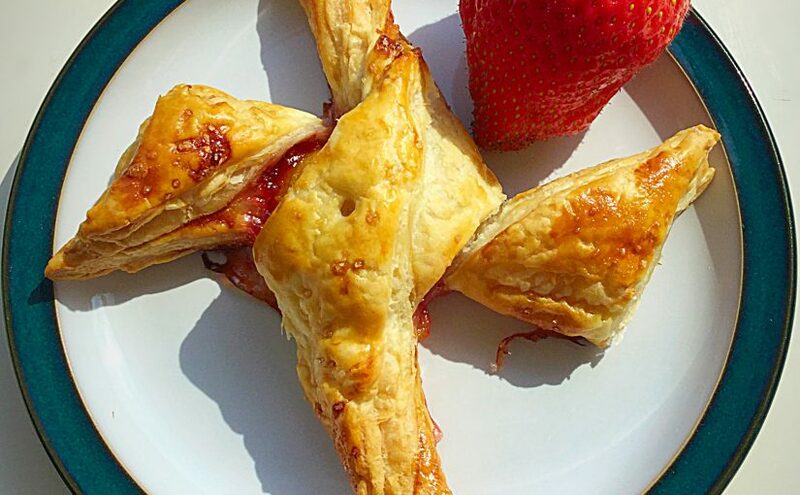 Twisted Fruity Jam Tarts delicious for breakfast. Inspired yesterday by a conversation on Twitter and with a spare packet of ready rolled, all butter pastry in the fridge, I challenged myself to come up with a twist on the regular jam tart. The result were these Twisted Fruity Jam Tarts, that taste rather like a Danish pastry. 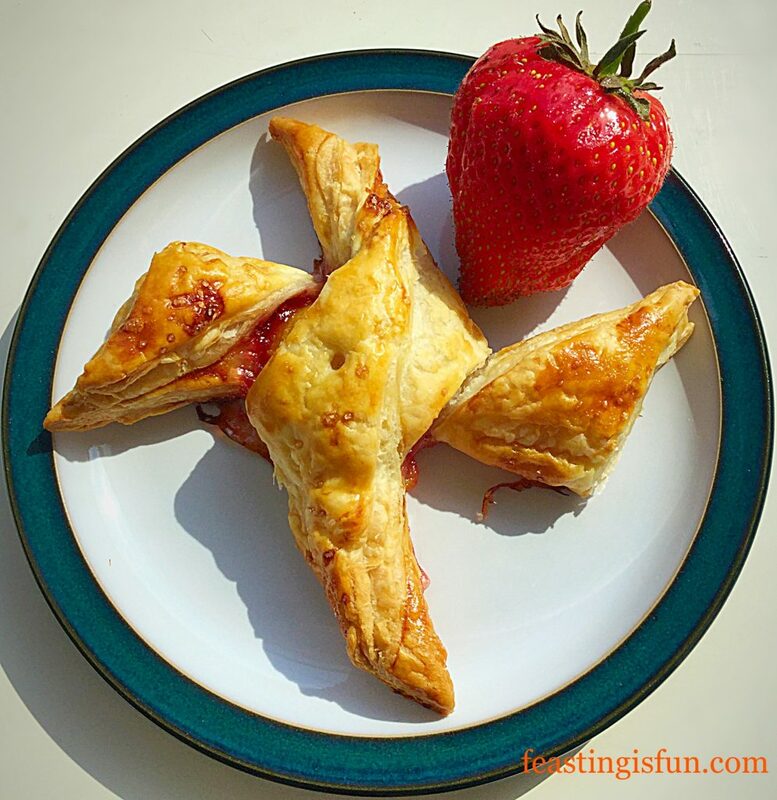 Incredibly easy to make, the golden pastry hides an apricot half and strawberry jam. A final sprinkling of demerara sugar over the egg washed pastry, a quick bake and the result is a delicious, fruity, flaky pastry delight! Having never tried to bake something like this before, I was unsure how they would turn out. I couldn’t have been more thrilled. Each twist is strong enough to hold the entire tart by, which makes them ideal as picnic and finger food. The demerara sugar caramelises on the pastry, nudging each twist into a sweeter flavour sensation. Combining apricots with strawberry jam was utter genius. The softened, tart apricots are offset by the sweet strawberry jam. Twisted Fruiy Jam Tarts a twist on a regular jam tart. Making these Twisted Fruity Jam Tarts was one of those moments in the kitchen when everything goes to plan and turns out better than I could of ever hoped for. If I can make these, then you can to. 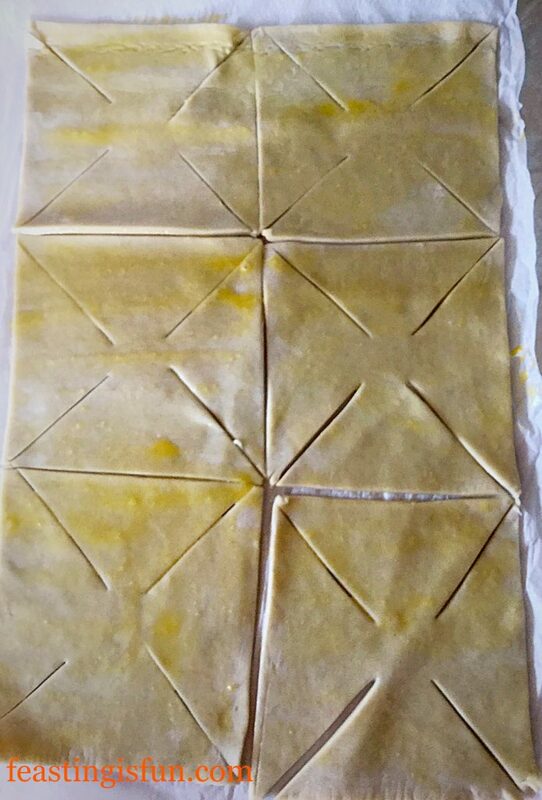 Unroll the puff pastry and ensure that you have a baking tray that fits the size of the pastry. Trim the paper that the pastry has been wrapped up in so that it fits within the tray, as you will be using it to bake the tarts on. Using a sharp knife cut the pastry in 6 equal squares. This photo shows how to cut the squares. Cut diagonally from each corner towards the centre two thirds of the way. See the photograph above. 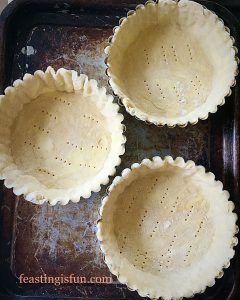 Crack the egg into a small bowl and whisk – this is the egg wash.
Brush over each of the squares with the egg wash.
Place a scant teaspoon of strawberry jam in the centre of each tart. Put half an apricot, flat side down, over the top of the jam. Twisted Fruity Jam Tarts the delicious filling they contain. Take the right hand point of the triangle at the front and place it over the apricot. Pressing down to secure the fold. Next take the left hand point of the opposite triangle and do the same. 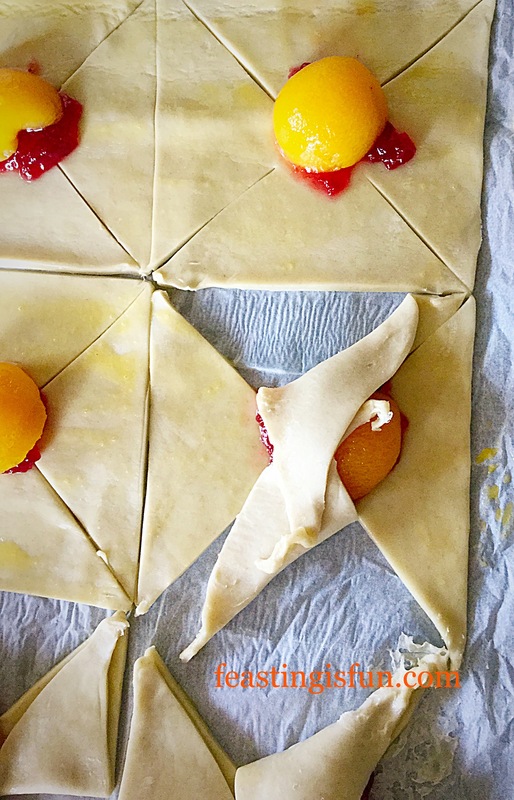 The pastry points should cover the apricot and jam. 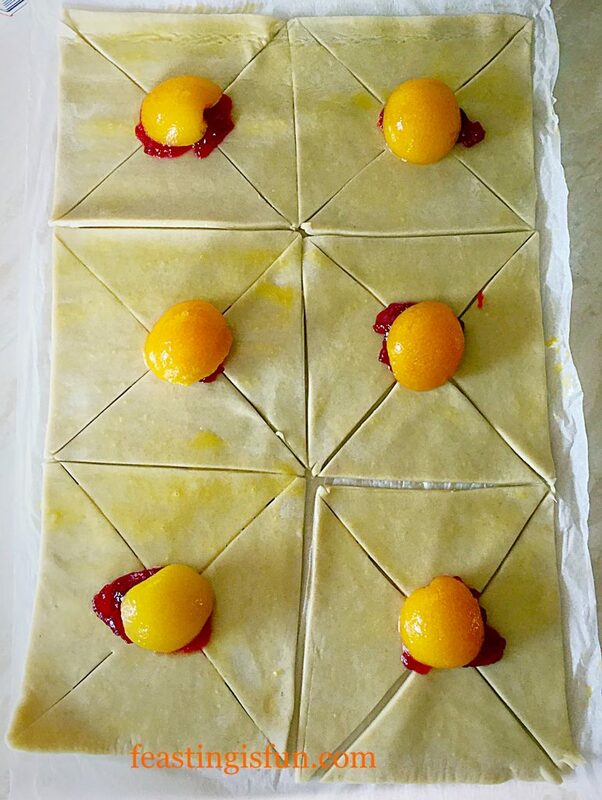 Continue for each of the tarts placing a cocktail stick through the pastry and apricot in the centre to secure it whilst baking. Next take the top right hand point of the triangle on the right of the tart and fold it so it is on top of the other point of the triangle. Work in the opposite direction for the left hand triangle. Each tart has an X type shape. Brush the tarts with egg wash again and sprinkle over liberally with demerara sugar. 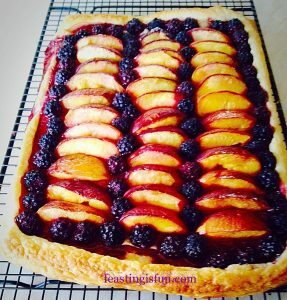 Place he Twisted Fruity Jam Tarts in the preheated oven for 25-30 minutes and bake until they are puffed and golden. 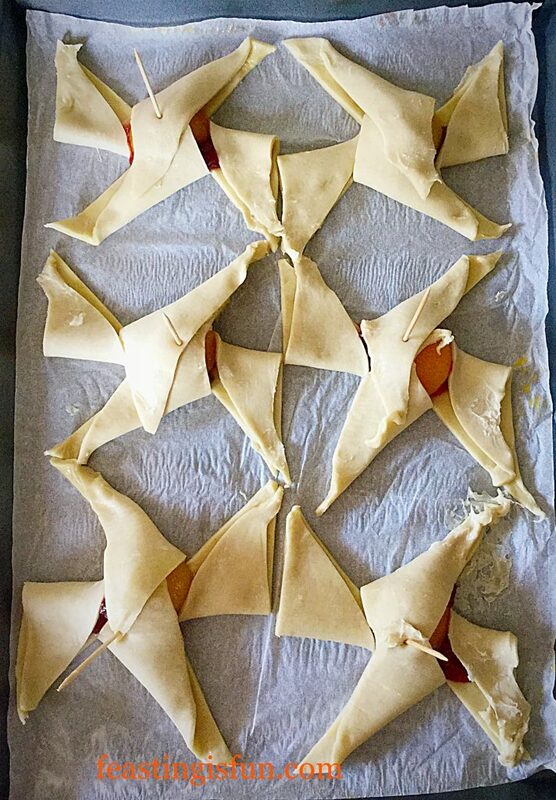 Once baked remove the tarts from the oven and transfer to a cooling rack. 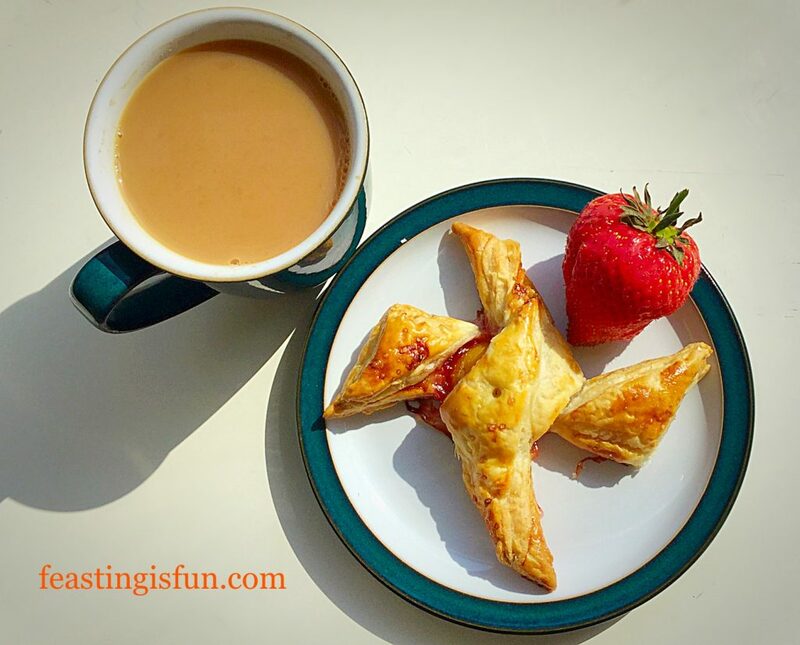 Twisted Fruity Jam Tarts delicious warm or cold. The portion size of these delightfully fun and delicious tarts is perfect. Not having to transfer the tarts from a floured board to baking parchment really does make these so easy to whip up. Although I haven’t tried it, I suspect these Twisted Fruity Jam Tarts would also freeze well, for up to one month – defrost and then refresh by reheating in a moderate oven for 10 minutes. I am definitely making a double batch next time! 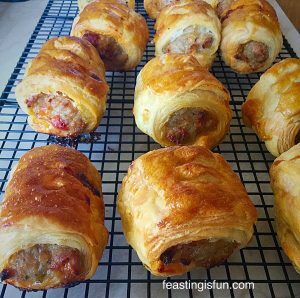 In fact, I need to make these again soon as I am sure they would be delicious served warm with a scoop of my Very Vanilla Ice Cream! So there you go easy peasy jam tarts, with a twist! 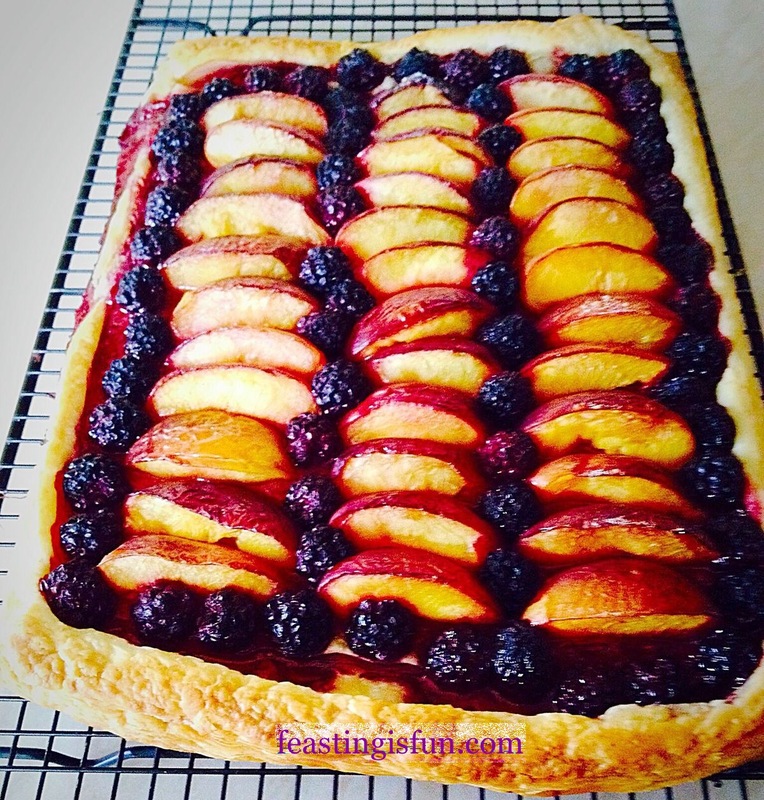 Blackberry Nectarine Tart a tasty quick dessert! Spicy Sausage Rolls with a little extra warmth added. 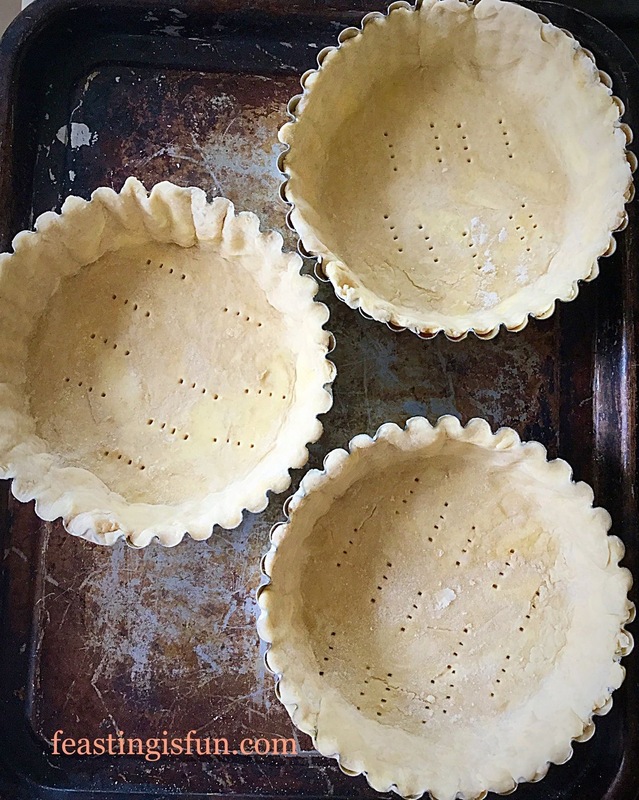 Perfect All Butter Shortcrust Pastry for when you want to make your own! Pastry is such a wonderfully versatile baking medium. I always have a stash of all butter puff pastry in the freezer. It is so handy when a quick meal, dessert, or even a decision to go out for the day tomorrow, as the weather looks good – picnic! 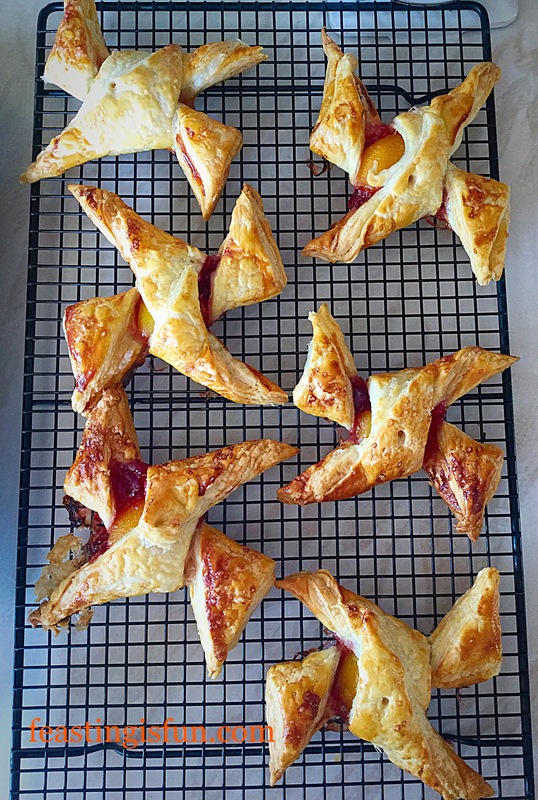 If you try these Twisted Fruity Jam Tarts please let me know how you get on? I love reading your comments and appreciate you taking time to write them. 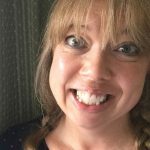 I also enjoy seeing your makes and bakes on Twitter and Instagram. Tag me in and I will be sure to give yo a shout out and retweet. Whatever you are making and baking in your kitchens, I hope that you are having fun preparing your feast!